People linked to the government took the offices of the Sécure Subcentral from the TIPNIS. “The police have forcibly entered and started to gasify women and children so that the group of the Government can enter and take over our offices,” said to ERBOL. It is not known whether the fact injuring people or balances gravity. Leaders of indigenous organizations in the Beni region called emergency to know this fact. “They are gassing our brothers. Police is biased and instead of placing order, has begun to lift out women and children who were inside,” said Youcy Fabricano. On Sunday, 70 indigenous people from the communities of La Asunta Oromomo and among other populations of the Sécure river, led by the president of the Confederation of Indigenous Peoples of Beni (CPIB) Pedro Vare, allied to the MAS, tried to take office. Women leaders from the Isiboro Secure Indigenous Territory and National Park (TIPNIS), which at that time were in the offices, prevented the entry of these people. According to Noza, there were more than 30 indigenous peole with their children that they avoided the takeover and began a vigil, and a resistance. On Tuesday, some of Sécure corregidores [magistrates] came to reinforce the defense of its headquarters. After two days of talks with the group of Vare, it was agreed to choose a directory to unify the organization then had two heads, one with Noza at the front and the other under Carlos Fabricano. The agreement broke down on Thursday because Vare imposed on a directory that was not agreed with all, so that the situation worsened and the women of the vigil decided to remain in place until last night [08/22/2014], when cops evicted them using chemical agents, as reported by indigenous leaders. “Right now, we denounce that the Bolivian indigenous people are being oppressed, persecuted and violated in our rights,” said Noza. Sub-central Sécure was divided after the march for TIPNIS. Unfortunate violence that just demonstrates how current government that self-appointed as defender of Mother Nature and indigenous people is just maneuvering to remain in power. With elections coming, the government appears to want to be in control of as many regions as possible to mount the fraud that can portray the coca-grower leader as the re-re-elected president, even though it is clearly illegitimate. 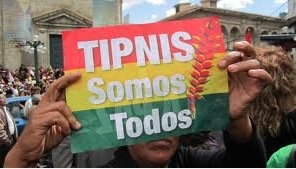 This entry was posted in Beni, Bolivia, Environment, Politics, Social Unrest, TIPNIS and tagged bad politics, demagogue, indigenous rights, National Parks, police aggression, public policy failures. Bookmark the permalink.